A typeface is a set of glyphs in a particular style, used to render characters. 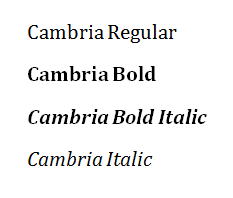 A typeface is also sometimes known as a font family. In Windows, a font is a set of glyphs defined by the combination of a typeface, font weight and font style (or slope). Samples of these fonts are shown below.